Phish bass player Mike Gordon took his own band on the road last year for a Winter tour. 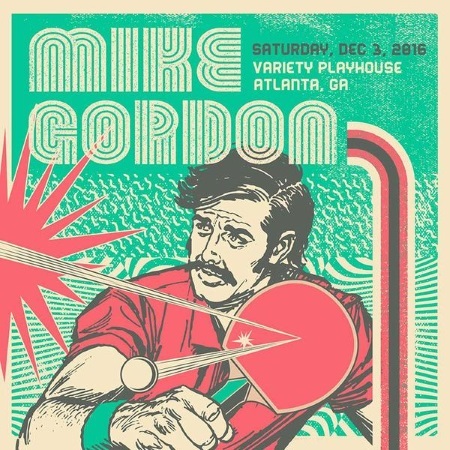 The show at the Variety Playhouse in Atlanta on December 3 is now available in pristine soundboard quality. He played with Scott Murawski (guitar), Craig Myers (percussion), Robert Walter (keyboards) and John Kimock (drums), focusing on quirky funk with a jazz rock twist. An evening with the Mike Gordon Band is never boring. Leave it to them to pull off a segue between the Gordon original Cruel World and Harry Nilsson's Everybody’s Talkin’. They like to change up things a bit, laying down a groove that might come off as very accessible but a major challenge to dance to. A bit of slowed down honky-tonk to the Phish tune Spock's Brain adding more layers to aptly named Peel and a couple of nod to the Talking Heads in Traveled Too Far, make this release geeky in a good way. Persevere and it opens up new horizons with each twist and turn. Plus it will scare off the musically challenged who dig the stuff that is piped through the sound systems of your local mall. 2016/12/03 Atlanta is available thru LivePhish.com.